The only binding force, that makes the political allies united anywhere in India, is heir mutual interdependence. The sojourn of the BJP and Telugu Desam Party (TDP) is no exception to this rule. As long as the National Democratic Alliance (NDA), a coalition headed by the BJP is dependent on TDP to rule the country, the BJP has to give a long rope to the latter before questioning any of its follies. The BJP has exhausted all its rope and reached a stage where it can not resist criticizing the TDP. The state unit of BJP had to experience embarrassing situations when the TDP in the state resorted to implement things that could irritate people at large. The BJP here is neither a ruling party nor an opposition force. It could not share the power in the state with the TDP, since the latter had willfully rejected to take part in the NDA Government while it chose to extend support to the same Government from outside. The state unit has forgone the privilege of being critical towards the Government. Lying low forever is not a practical strategy to any political party. The BJP in Andhra Pradesh learnt this lesson so early. Particularly when all other parties ventilated their ire against the unprecedented and manifold hike in power tariff, the BJP minced words. Prostration of this kind will definitely mar the Party’s image in the district. The BJP in the center also doesn’t expect its State Unit to cause any inconvenience to the TDP for the reasons best known to it. The TDP has had the reputation of being the most reliable ally of all. Particularly the Prime Minister ,Vajpayee, likes those Partners who give the least trouble. Unlike Mamata of Trinamul Congress, Babu of TDP has never threatened nor blackmailed him. However, ha had his Lion’s share for his non-participation in the Government. The post of the Speaker, Lok Sabha, which has increased prominence in the coalition era, went to his party second time. It was a big stake of TDP. Taking his indispensability into account, the Central leadership, particularly doesn’t like the idea of opposing him on any count. Surprisingly the leaders of both the Parties chose the time when their practical heads were not with in their reach, (Babu was visiting China and Vajpayee was undergoing knee- plate surgery) to trade charges with each other. 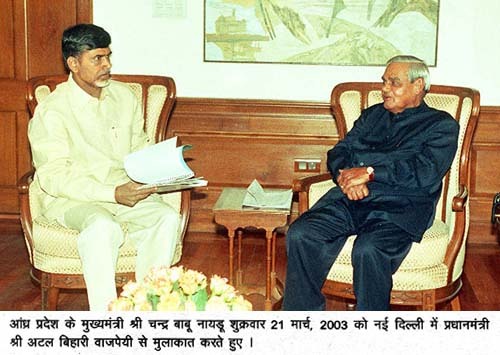 Though, Bandaru Laxman, the proxy of Vajpayee was readily available, he found himself busy contradicting the statements given by the RSS chief. Though the TDP enjoyed electoral gains for its truck with the BJP during the last General Elections, it gave ample space to the latter after the elections to penetrate into rural masses. Now the BJP is spreading its base in villages and getting ready for elections for local bodies. At this juncture, the BJP has to be very careful in playing cards. It has to strike a clear line as to the economic excesses committed by the TDP Government. For instance, rise in Power Tariff invited public anger. The BJP has to come out of this with a clean chit and prove itself that it is not a part in such anti-people decisions taken by the Government. No doubt, the BJP in Andhra Pradesh is caught between the Devil and the Deep-Sea. Still it has the way out. It can give support as an ally and criticize like an opposition Party. The TDP started adopting the same line in the center long ago. Now it is the time for BJP to reciprocate this. ← సామాజిక న్యాయమా? ‘సామాజిక వర్గ’ న్యాయమా?